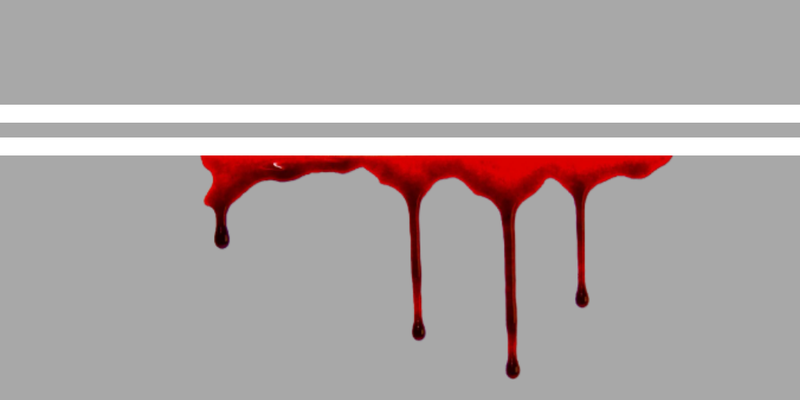 In Russia, the “red lines” which define the limits to what journalists can write or say, are often referred to as the “double white lines”. Like in traffic, if media outlets cross the double white lines, they put themselves in danger and may be punished. Two weeks ago, we described how the independent Russian newspaper Novaya Gazeta was targeted with harassment and intimidation ahead of its publication of an investigation into a series of poison attacks and the killing of a Kremlin-critical blogger. 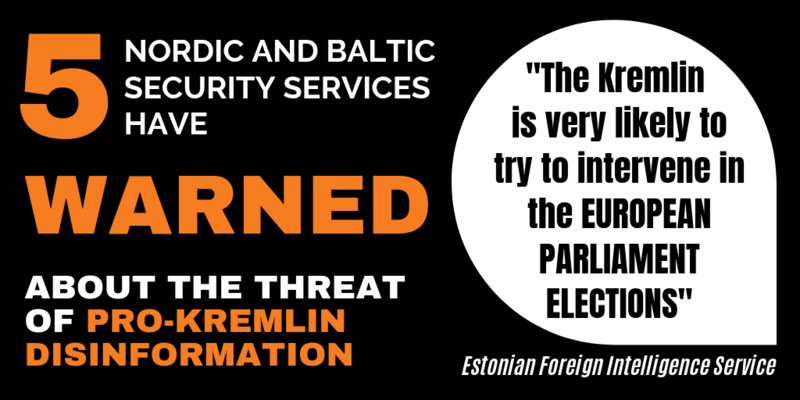 According to the newspaper’s sources, these attacks were carried out by a special team in the security service of Yevgeniy Prigozhin, the owner of the “troll factory”, and popularly known as “Putin’s chef”. The lines Novaya Gazeta in this case had crossed were in other words not the government’s, but those of a privately owned organisation with close ties to the Russian authorities, and which is already known for supporting the government’s disinformation agenda with online trolling. The punishment for Novaya Gazeta’s crossing the lines took the form of a funeral wreath with the name of the journalist behind the investigation and a severed goat’s head delivered to Novaya Gazeta’s newsroom. 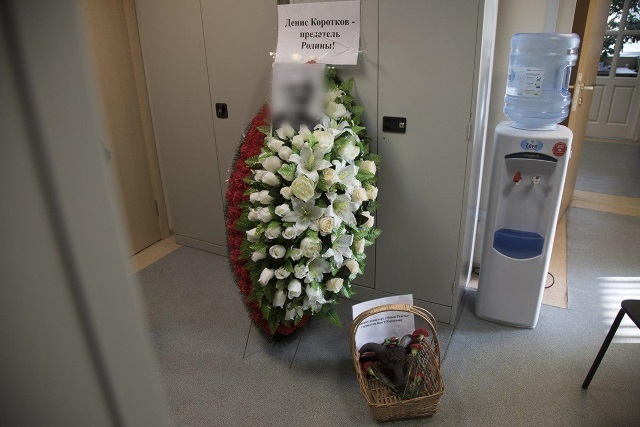 Novaya Gazeta received a funeral wreath and a severed goat’s head addressed to the chief editor and the journalist behind the investigations. Image by Novaya Gazeta. The newspaper issued a statement after it received these threats and after the wave of harassment it had experienced following reporting about Russian military involvement in Syria. The newspaper’s statement clearly identifies disinformation, trolling and harassment of journalists as parts of one cluster of problems. Slander is a dangerous weapon in our times. Slander and fake news lead to war, murder and attacks on public figures and journalists. The people who unleashed the campaign against Novaya Gazeta and its journalists in social media are well aware of the consequences of this writing in the atmosphere of hysteria and hatred that has reached unprecedented levels in Russia. It is especially disgusting when a blatant lie forms the basis of a “wave of popular indignation”. The allegations that Novaya Gazeta allegedly publicised data about Russian pilots fighting in Syria, which put their families in danger, are simply fake. We did not have any publications on this topic, neither in the newspaper nor on the website. But this lie, repeatedly reinforced by the trolls and comments of some “opinion leaders” who were either bought or used in a dubious scheme, poses a real danger to journalists. On the internet, there are calls for physical punishment of journalists;sinister “gifts”, symbolizing the death of specific people, are being brought to our newsroom. We do not intend to tolerate this, especially since we can perfectly well imagine where the threat comes from. We have only two weapons: publicity – and therefore we continue our work; and the law. The Ministry of Interior and other law enforcement agencies are obliged to do everything in order for the law to protect us. We demand that these threats are investigated and that those responsible are punished. 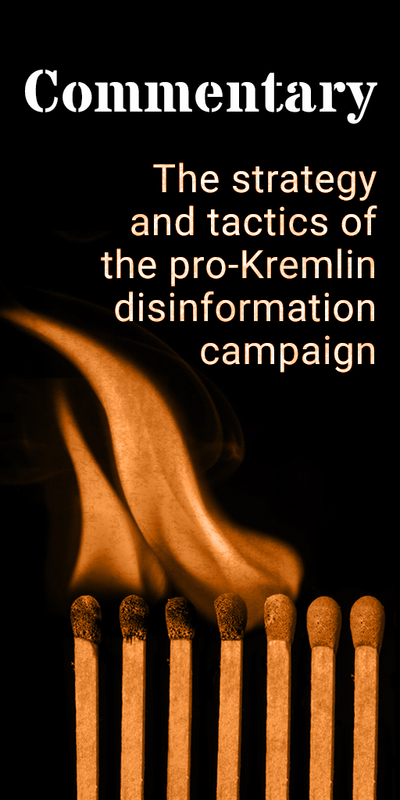 In Russia, the spread of disinformation is supported by instructions from the Kremlin: a narrative that trickles down through the media organisations controlled by and loyal to the authorities. However, some of the more dirty work is carried out by private actors with close financial ties to the authorities. As the case of Novaya Gazeta suggests, the sanctions imposed on Russian journalists that disrespect the narrative and cross “double white lines” can also be carried out by private actors. When journalism is controlled in this way with intimidation and crackdowns, state-controlled and state-loyal disinformation has much more free play and its impact on society becomes larger. Novaya Gazeta’s statement reminds us that the fight against disinformation is also a fight for free and independent media.